A better route for bikes today. My childhood years were spent in Pullman, Washington where biking, back then, was the pits. 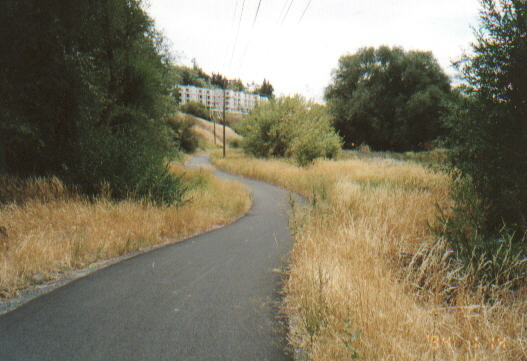 Today, Pullman enjoys some wonderful bike paths, such as this alternative to North Grand. In the 60s, it was hard to avoid North Grand, a busy 4 narrow lane. It was full of frat house kids behind the wheel. Pullman is home of Washington State University. One day, as I was biking home from school in the right lane, a car was trying to pass on the right. Seeing, me he had to swerve back into the left lane in front of another car. That car laid on the horn. Luckily I was okay. Remember, kids didn't wear helmets back then. Today, one can avoid North Grand by riding above trail. In the 1960s, there was Scrappy's Junkyard, where the trail is now. Some boomers have fond memories of old Scrappy Richardson. He could miraculously find just the right gas cap, if you needed one, among his mountains of junk. My memories are less positive. I feared getting near the Junkyard dogs. If I could be a middle school kid in the Pullman of today, with that nice bike path instead of "North Grand or the junkyard," I would take up that offer. Today's kids will have some nice memories. 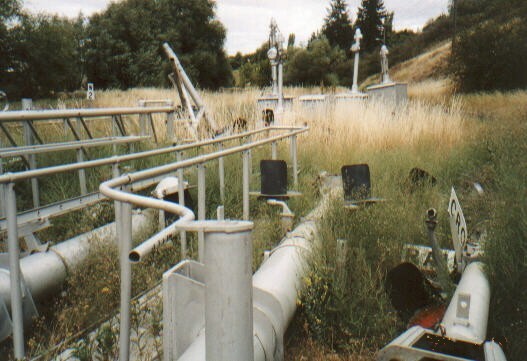 Dismantled crossarms from railroad along North Grand Avenue in Pullman, WA. 2001. Railroad is still in use. See also: Pullman to Moscow Bill Chipman Trail.